Will power, self confidence, magnetism, robust outlook, diplomatic and courageous. Possessive, jealous, dominating, cunning, ruthless and proud. Will power, self confidence, magnetism, robust outlook, diplomatic, courageous, possessive, jealous, dominating, cunning, ruthless and proud. Marie Curie, Jawaharlal Nehru, Indira Gandhi, Prince Charles and Truman Capote. Scorpios can follow the following professions - Physicians, Actors, Chemists, Detective, Psychiatrist, Spiritualist, Military Leader and a Pioneer. The person could be a powerful linguistic. Occupations where investigations are required are emphasized. You can also be industrialists, a navy captain and an underwater diver. Scorpio is a great lover and a romantic one. You know how to sweep your sweetheart off her feet. Scorpio is capable of having a platonic love. 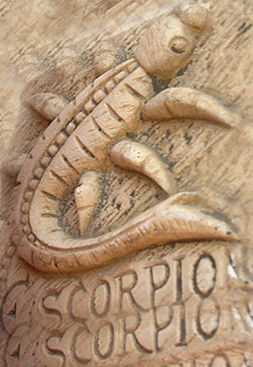 Scorpio has a strong combative instinct and a lot of aggressiveness and ego. Your marriage will be for the keeps and you are a great lover but not an ideal husband/ wife. You wish to marry and have a home for which you may sacrifice much. In total, there have been 25171 visitors (100501 hits) on this page!